You want your kids to have stylish, quality clothes, so being a bargain shopper is a must, especially in today’s economy. This Little Piggy Consignment is a semi-annual event where hundreds of families come to shop, sell and save! With thousands of items to choose from, you’re sure to find PLENTY of must-have bargains for your little ones! Be one of the first to shop the bargains by purchasing a VIP PRE-SALE PASS! Your pass allows you to shop before the public at our VIP Private Sale, before we open to the public. VIP Passes are purchased below and cost $7. Each pass admits one person and is non-refundable. (Children under 15 are free). We make every effort to not have any recalled items at our events, however we encourage you to check WeMakeITSafer.com for recalled items. Leave personal items (large bags/purses & diaper bags in your car). Strollers are allowed for your child and will be tagged to identify as personal property. We may be looking in your stroller and bags as you leave the store. This Little Piggy Consignment will do our best to keep consignors’ items safe. IF POSSIBLE, please leave your children at home to allow you to concentrate and shop without distraction. Children need to stay close to an adult at all times! The event can get very overwhelming for little ones and it can get very crowded. We care about keeping children safe so supervision is required at all times. When shopping be sure to check a size up and down. Each brand can run a little big or small. Shopping ahead for the next season is a great idea too. Large items you would like to purchase may be held for you while you shop. If you are unable to return unwanted items to the racks to their proper size, please give to a volunteer! Please remember all of the toys and books for sale belong to families, just like you. To avoid damage, please do not allow children to play with consigned items. Chances are those items might just belong to a friend of yours! If you come across items with stains, holes or other damages that somehow “slipped through the cracks” please let a volunteer know! We immediately remove all items that are stained or damaged from the sales floor. We DO make a note of consignors who submit stained clothing and if we come across a seller with a lot of defective items they will not be asked to sell with us in the future. Volunteers do their best to catch these at check-in, but they can miss things from time to time. 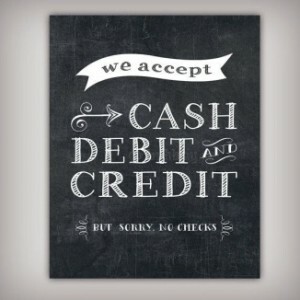 We accept cash, Visa and MasterCard. If you are paying with MasterCard/Visa, bring your driver’s license or photo id with you. They will not accept your credit card without a picture ID! Sorry, no checks. California sales tax will be applied to all purchases. Please carefully inspect each item you plan to purchase!